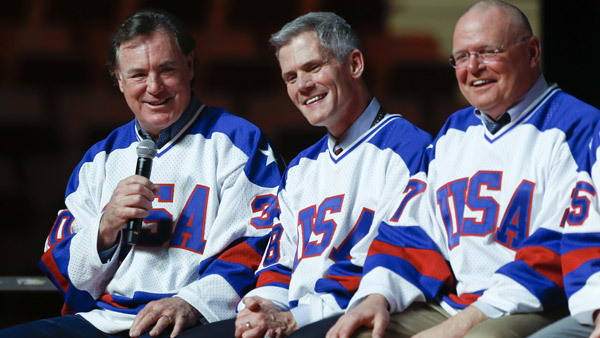 In opener to FPA national conference, diversity and retirement awards are presented, while goalie for the 1980 Olympic hockey team regales attendees. The opening session of the Financial Planning Association’s national conference featured a military fife and drum corps, attendees from 19 countries and “all compensation models,” and a bona fide Olympian. In Boston on Saturday morning, FPA President Ed Gjertsen introduced two diversity scholarship winners — Kristin Fang (originally from China) and Pamela Pena Serrano (originally from Colombia) and presented the third annual Montgomery-Warschauer Award to Morningstar’s David Blanchett, for his May 2014 Journal of Financial Planning article “Exploring the Retirement Consumption Puzzle.” Gjertsen said of Blanchett’s article: “I told David that if you question what we do, you get an award,” while in a media appearance on Sunday, he said of the two scholarship winners that he expected that they would, like previous scholarship winners, become leaders in FPA’s continuing diversity push within the profession. John McAvoy, the soon-to-be president of the FPA’s Massachusetts chapter and chairman of the BE Conference Task Force, wore a lobster hat as he introduced financial media maven Jill Schlesinger, who welcomed keynote speaker Jim Craig, the goalie of the Olympic gold-medal winning 1980 U.S. men’s hockey team. Still trim in his mid-50s and sporting a Massachusetts accent, Craig kept the attention of attendees as he spoke for 30 minutes on the lessons he learned from athletics and his subsequent sales and marketing career, before conducting a fireside chat with Schlesinger. In addressing his advertised topic of what makes for winning teamwork, Craig spoke of how he strove to fulfill his childhood dreams, which didn’t work out exactly in sequence, and how several people in his life gave him confidence to strive for those dreams. He then turned those lessons into talking points for advisors. Unlike many other big-name speakers, Craig understood the roles advisors played on behalf of their clients. He suggested advisors should organize their work “around your clients’ dreams and watch them come true.” Moreover, he said advisors should “listen to what your clients want,” and “don’t let your memories ever be bigger than your dreams.” He even suggested the right strategy for a conference of financial planners: “This is your locker room; you need to feel safe in the locker room” to admit what you don’t know and to learn from your peers.